KUALA LUMPUR: TH Properties Sdn Bhd, the property arm of Lembaga Tabung Haji, will be tapping the expertise of the Malaysian Society for Engineering & Technology (mSET) for continued value-add to its development projects. TH Properties chief executive officer Zaharuddin Saidon said it was vital for a developer to look at quality and not just the bottom line. “The tie-up with mSET will help us better identify building procedures and improve construction efficiency and quality,” he told a press conference announcing the tie-up with mSET yesterday. Set up in December 2007, mSET comprises a large pool of engineers, quality surveyors, architects, engineering technologists, technicians and allied professionals. Its president Prof Abang Abdullah Abang Ali said mSET was formed to reach out to the large number of engineers, engineering technologists and technicians who were not professionally networked. “Collaborating with TH Properties will help improve the level of performance of our professionals,” he said. Zaharuddin said TH Properties would be seeking mSET’s assistance in the development of all of its projects. Besides its flagship project in Bandar Enstek, Negri Sembilan, the company also has a number of projects in the Klang Valley. “We will seek its (mSET) assistance as and when necessary,” he said, adding that mSET was well-connected with foreign-based professional organisations. “Finding the right consultants can take time and delay projects. Through mSET, we can have speedy access to a host of local and foreign professionals,” he said. He added that by having a pool of consultants at its disposal, TH Properties could carry out its construction works more prudently. On another note, Zaharuddin said it was premature for the Government to consider reviewing all existing developments near hillslopes following the landslide at Bukit Antarabangsa last Saturday. “Projects should not be halted just because of a disaster. Land is scarce and we still need to develop projects on hillsides. “This is where engineers and architects play a crucial part in giving good advice to developers on their projects,” he said. MALAYSIA Airports Holdings Bhd (MAHB) has completed the first phase of its satellite retail optimisation project (SROP) at the KL International Airport (KLIA) in Sepang, which began in May this year and due for completion end-2009. With the completion of the East Zone, the airport operator will continue to work on the West, South and North zones soon. The East Zone boasts more than 12 new outlets at the satellite building, including Choc Shop International, Dome, Eraman Malaysia, Harrods and Pusrawi Medicare. 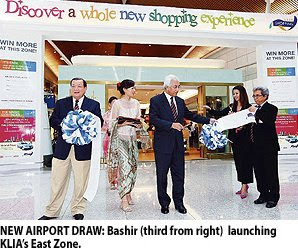 The launch of East Zone yesterday also marked the start of the second phase of the KLIA Shopping Campaign, which offers RM2.7 million of prizes at the KLIA and the low-cost carrier terminal LCCT. MAHB managing director Datuk Seri Bashir Ahmad said the company is expecting a one to two per cent growth in passenger arrivals at all 39 airports it operates in the country in 2009. "The growth will partially be attributed to the availability of more retail space and reduced operating costs," Bashir told reporters after the launch of the East Zone retail units. BUYING property in another country is not for the faint-hearted and even professional institutional investors spend a great deal of time and money researching the markets they are interested in before committing. This article will focus on advice for individual investors interested in the British market. Historically, Malaysians have purchased property overseas for various reasons, the most common of which is to diversify their property portfolio and to invest in more stable and transparent markets than many in Asia. Homes are also purchased overseas as corporate residences or to provide accommodation for children studying in foreign universities. Part of the joy of buying overseas can be the research into the market and enjoying a working holiday. A great deal has changed in the British economy since early 2007. In summary, the British currency has weakened, the capital value of homes has dropped and the economy registered zero economic growth in the second quarter and into negative growth of -0.5% in the third quarter. The pound recently slid beneath the US$1.80 mark for the first time in two years and dipped to a new record low against the Euro. Attention is increasingly turning to the extent to which house prices must fall before confidence is regained. Savills’ expectation is that values of prime property in London will fall by 25% over the course of 2008 and 2009 and marginally less so in the regions. Only in the very top of the market have prices held firm, with the £10mil-plus market in London and £4mil-plus market in the country continuing to show marginal growth (1.2% and 0.7% respectively in the first half of 2008). On a more positive note, Savills’ research in London estimate that the recovery in the housing market will be led by London and the South East of England and by 2012 house prices will have recovered to those of pre-slump levels. Changes in the law have made buying a home easier and more transparent, which should appeal a great deal to foreign investors. Investors must always ask the selling agent for a Home Information Pack (HIP), which became compulsory since Dec 14, 2007. Following the start of the global credit crisis in 2007, activity in Britain’s commercial development sector started to fall steeply. On average, prime offices have become 20% cheaper across Europe as at end of the third quarter with average prime central business district yields of 6%. The City of Birmingham seems to be bucking this trend, with a take up 606,292 sq ft of Grade A office space in the third quarter and an upward pressure on rents, the highest rent secured this year was £33 (RM179) per sq ft per month. Despite this, there are many ways to invest in unique commercial opportunities, from Britain’s fledgling real estate investment trust market to direct commercial property ownership. While much residential property investment is driven by expectations of the growth of its capital value, commercial property returns are more focused on their rental income. In conclusion, history has shown that the only certainty in the future is that capital values will bounce back and the rental market should strengthen in the immediate term since the introduction of tighter lending criteria. Investing in the British market must be carefully timed to make the most of the weak currency and falling prices and as always the right location is paramount.